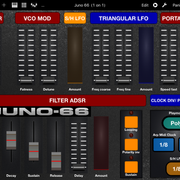 i am working on a control panel for the Ipad app TB Midi Stuff for the Juno 66 mod. and midi CC 36 ( SH Lfo clock source ). There are 3 settings for each CC. Internal,midi note and midi clock. What is the value range from 0-127 for this 3 seetings ? Or is it not possible to change that by external controler ? P.s if you want to published the final panel on your site,tell me and i will send it to you. fist of all! This looks amazing! Such a pity that I don't have an Ipad and can not test it. But certainly happy to put it on the website.